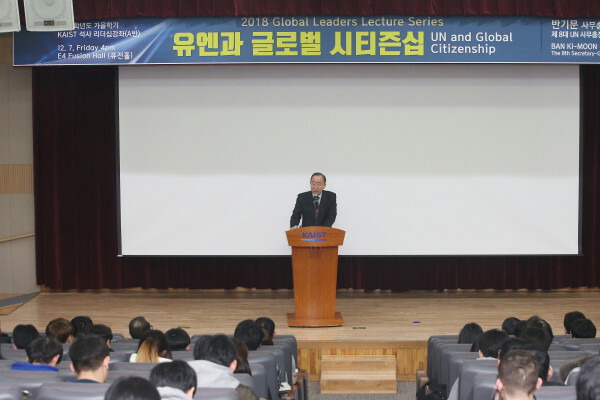 On December 7, KAIST invited one of the most admired people by Korea’s younger generation to give a lecture on UN and Global Citizenship, as the final session of the Global Leaders Lecture Series 2018. He is the 33th Minister of Foreign Affairs and the 8th Secretary-General of the United Nations, Ban Ki-Moon. Mr. Ban is recognized for making significant contributions to world peace and environmental preservation during his term at the UN. Mr. Ban first opened his lecture by explaining his great expectations for KAIST students. “KAIST is one of the outstanding universities that fosters the world’s best scientists and for that I have a great expectations for your role in the era of the Fourth Industrial Revolution. In this rapidly changing society, acquiring global citizenship is most important,” he said. Who are global citizens? According to UNESCO, they are ‘active promoters of more peaceful, tolerant, inclusive, secure and sustainable societies’. He stated that global leaders lacking global citizenship has resulted in so many disputes among countries and concerns for themselves. Mr. Ban proposed four required mindsets for global citizenship. The first is to have respect, empathy, and trustworthiness for others. He believes that speaking is the foundation of knowledge, while listening is the foundation of wisdom. Although the concept of philosophy might vary between the East and West, listening to others is very important for gaining respect, empathy, and trustworthiness. Third, having a critical mindset is important, especially for scientists because it helps with solving problems by taking a scientific approach, without missing any of the small things. It is essential for scientists to find out new things, particularly in the era of the Fourth Industrial Revolution and informatization; however, they need to keep in mind how their findings will affect us. For instance, they need to question how robotics will change humans’ living patterns, as well as their role and how it links to humanity. Last but not least, passion, which goes along with compassion, is required for helping others. Ban thinks people without passion are like the walking dead. When pursuing policies, they need to have the passion to drive it. At the same time, they need to have compassion for creating a happier life for everyone.